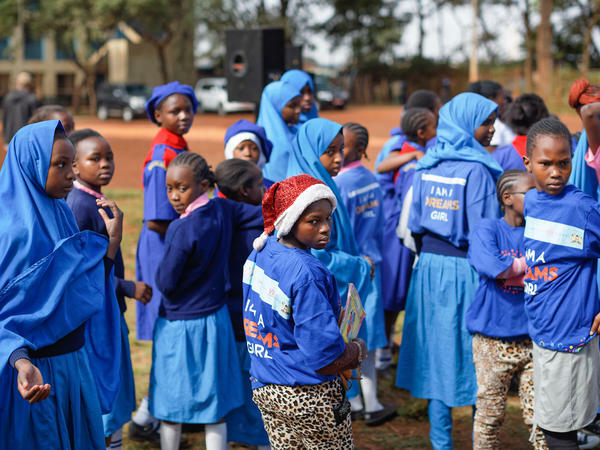 Girls at the St. John's Community Centre in Nairobi, Kenya, attend an event supported by PEPFAR, the President's Emergency Plan for AIDS Relief. The 22nd annual International AIDS Conference is currently underway in Amsterdam. And several studies are looking at the U.S. government's largest foreign HIV program: the President's Emergency Plan for AIDS Relief, or PEPFAR. The multi-billion dollar program to combat HIV and AIDS globally has been slated for cuts by the Trump administration. But researchers and African health officials credit the program started by President George W. Bush with helping to change the trajectory of the AIDS epidemic. Bernard Haufiku, the current minister of health for Namibia, says that for his small southern African nation, the impact of AIDS has been enormous. "Apart from the human life that has been lost, it eroded our economy. It invaded our social fabric," Haufiku says. "There are orphans because parents passed away. And now we are spending on health so much that we could have spent on other development projects." Haufiku says Namibia has done this by focusing on "hot spots" of transmission, identifying who is infected and getting them onto lifelong anti-AIDS drug therapy. "When you put people on treatment," he says, "you are basically reducing the risk of transmission." Namibia has a tiny population of 2.5 million people. It has limited resources. Last year Namibia got $73 million dollars in funding from PEPFAR. Haufiku says the strides Namibia and other African nations have made against HIV would not have been possible without PEPFAR. "PEPFAR, which is basically U.S. taxpayers' money, has made a huge difference," he says. "It's been a matter of life and death actually in many, many African countries." Another paper released today at the AIDS conference looks at whether PEPFAR spending in Kenya reduced the transmission of HIV from pregnant mothers to their babies and led to a drop in infant mortality. Donna Spiegelman, a professor of biostatistics at the Yale School of Public Health, is one of the co-authors of the Kenya report. She looked at areas of Kenya where nearly a quarter of a billion dollars in PEPFAR funds were spent over the course of a decade. The funds paid for a wide range of HIV and AIDS programs, from testing to treatment to prevention campaigns. "It is a major investment of the U.S. government," Spiegelman says. "It's important to be sure that the dollars we're spending across a range of public health programs are being spent wisely and are getting the results that are expected." During the time period she was looking at, from 2004 to 2014, infant mortality went down nationwide in Kenya. But Spiegelman (who was at that point working at the T.H. Chan School of Public Health at Harvard) and her team found that in the 25 percent of provinces with the most PEPFAR funding, infant mortality was 30 percent lower than the provinces that got the least amount of money from PEPFAR. Not only were deaths prevented, tens of thousands of babies were born free of HIV even though their mothers were carrying the virus. "So we're happy to contribute to showing that in this particular case it seems as if the investment was well worth it," she says. The Trump administration has been lobbying to cut nearly a billion dollars out of PEPFAR's $4.5 billion-a-year budget. The administration says it wants to streamline the program. Rather than fund HIV/AIDS programs in dozens of countries around the world, it wants to focus primarily on 13 countries that are close to getting the disease under control. So far, however, Congress has resisted those proposed budgetary cuts. Research presented at an international AIDS conference in Amsterdam this week portrays one U.S. government program as a success story. The initiative is known as PEPFAR, the President's Emergency Plan for AIDS Relief. It's a multibillion-dollar program, and the Trump administration has it slated for cuts. But this research, says PEPFAR, has helped bring the AIDS epidemic under control in many parts of the world. NPR's Jason Beaubien reports. JASON BEAUBIEN, BYLINE: Bernard Haufiku is the current health minister for Namibia. He says that for his small Southern African nation, AIDS has been more than just a disease. BERNARD HAUFIKU: Apart from the actual human life that had been lost, it eroded our economy basically. It invaded our own actual social fabric. Now we're spending on health so much that we could have spent on other development project. BEAUBIEN: Despite 12 to 14 percent of all adults in Namibia being HIV positive, the country now says it's on target to meet ambitious U.N. goals to eliminate AIDS as a public health threat by 2030. A study released at the conference shows that over the last two years, the number of new HIV infections in Namibia dropped by 40 percent. Haufiku says Namibia has done this by focusing on hotspots of transmission, identifying who's infected and getting them on treatment. HAUFIKU: And as you know that when you put people on treatment, you basically are reducing the risk of transmission from the next person. BEAUBIEN: Namibia has a tiny population of 2 1/2 million people. It has limited resources. Last year, the country got $73 million in funding from PEPFAR. Haufiku says the strides Namibia and other African nations have made against HIV would not have been possible without PEPFAR. HAUFIKU: PEPFAR, which is basically U.S. taxpayers' money, has made a huge difference as a matter of life and death, actually, in many, many African countries. BEAUBIEN: President George W. Bush launched PEPFAR in 2003 as an emergency measure. It's since grown into the largest source of U.S. funding to combat HIV globally. Another study released at the AIDS conference looks at whether PEPFAR spending in Kenya reduced the transmission of HIV from pregnant mothers to their babies and led to a drop in infant mortality. Donna Spiegelman, a professor of biostatistics at Yale, is one of the co-authors of the Kenya report. Over the course of a decade, nearly a quarter of a billion dollars flowed into Kenya through PEPFAR. DONNA SPIEGELMAN: It is a major investment of the U.S. government. I think - I feel as a statistician and as a public health professional it's really important to be sure that the dollars we're spending across a range of public health programs are being spent wisely. BEAUBIEN: During the time period she was looking at from 2004 to 2014, infant mortality went down nationwide in Kenya. But Spiegelman's team found that in the provinces with the most PEPFAR funding, infant mortality was as much as 30 percent lower than in the provinces that got the least amount of money from the program. Not only were deaths prevented, tens of thousands of babies were born free of HIV even though their mothers were carrying the virus. SPIEGELMAN: So we're happy to contribute to showing that in this particular case, it seems as if the investment was well worth it. BEAUBIEN: The Trump administration wants to slash nearly a billion dollars out of PEPFAR's $4 1/2 billion annual budget. The administration says it wants to streamline the program and rather than fund HIV/AIDS programs globally to focus on 13 countries that are close to getting the disease under control. So far, however, Congress has resisted those cuts. Jason Beaubien, NPR News. Transcript provided by NPR, Copyright NPR.